Go to original pattern for design DROPS Children 34-12. Knitted slippers for kids in DROPS Nepal. Piece is knitted back and forth in garter stitch and rib. Size 29-40. 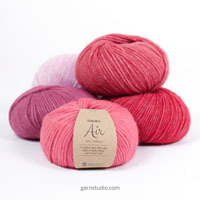 Increase by making 1 yarn over. On next round knit yarn over twisted to avoid holes. All decreases are done from the right side! 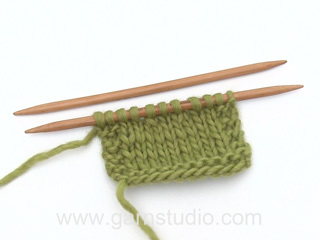 Decrease after 1 edge stitch as follows: Slip 1 stitch knitwise, knit 1, pass slipped stitch over stitch worked. Decrease before 1 edge stitch as follows: Knit 2 together. Measure when slipper is flat, it is important not to stretch the piece when measuring. Work piece back and forth on needle. Start with the flap at the top of foot, then work downwards, under the foot and then up before finishing with the other flap on top of foot. Then sew together mid front on toe and mid back on heel. Cast on 3-3-3-3 stitches on needle size 4 mm with Nepal. Work 8-8-8-10 ridges in GARTER STITCH - see explanation above. 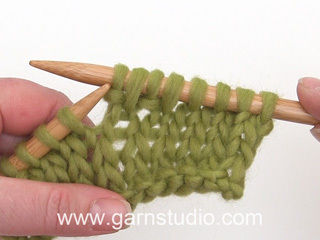 Continue in garter stitch AT THE SAME TIME on first row increase 1 stitch inside 1 edge stitch in each side - read INCREASE TIP. Increase like this every other row 3-4-5-5 times in total = 9-11-13-13 stitches on needle. Then cast on 3-3-3-4 new stitches at the end of the next 2 rows = 15-17-19-21 stitches. 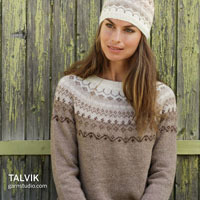 Knit 1 row from right side while at the same time working 2 stitches in every stitch = 30-34-38-42 stitches. Knit 1 row from wrong side. Now work rib as follows from right side: 1 edge stitch in garter stitch, knit 1, * purl 2, knit 2 *, repeat from *-* until 4 stitches remain on needle, purl 2, knit 1 and 1 edge stitch in garter stitch. Continue rib for 5½-5½-6-7 cm. 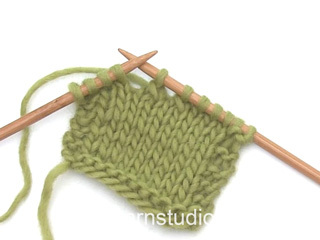 REMEMBER KNITTING TENSION - read MEASURING TIP. Insert 1 marker in each side (= mid under foot). Continue with rib for 5½-5½-6-7 cm from markers, adjust so that next row is worked from right side. Then work in GARTER STITCH, work 1 row from right side where all stitches are worked together 2 by 2 = 15-17-19-21 stitches. Work 1 row from wrong side. Cast off 3-3-3-4 stitches at the beginning of the next 2 rows = 9-11-13-13 stitches. On next row from right side decrease 1 stitch inside 1 edge stitch in each side - read DECREASE TIP! Decrease like this every row from right side 3-4-5-5 times in total = 3-3-3-3 stitches. Work 8-8-8-10 ridges, cast off. Fold the slipper at the marker threads. 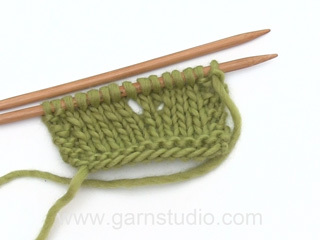 Sew together in both sides (mid front on toe and mid back on heel) - sew inside 1 edge stitch in garter stitch. Make a knot with the flaps.